The 2013 BC Beer Awards and Festival happened on Oct 19 and it was good times in a room full of great beer. Vancouver Sun has the complete list of winners. 4th Annual BC Beer Awards & Festival on Sat., Oct 19, 2013 from 1-6pm at the Croatian Cultural Centre. Celebrating the best of BC craft beer with cask festival and awards ceremony. Tickets are now SOLD OUT. So many craft beer events going on these days, and so many others doing a better job than me keeping on top of them all and spreading the word. To find out what is happening craft beer-wise in Vancouver and area, check out the handy Craft Beer Events calendar that the good folks at CAMRA BC Vancouver chapter have on their site (along with a bunch of other cool info). Everything you need to know...all in one place! Georgia Strait has a great article on the next wave of breweries coming to Vancouver this year, called From 33 Acres to Brassneck Brewery, Get Ready for a Wave of New Craft Beer in Vancouver. Cannery Brewing in Penticton, BC has released this year's edition of its annual Wildfire IPA with a charitable twist: a portion of the proceeds from sales will be donated to the Canadian Fallen Firefighters Foundation. This organization works to honour the memory of firefighters killed in the line of duty and to support their families. A worthy mission indeed, considering the devastating effect that forest fires can have in BC, and the risks that firefighters take to protect BC communities. The beer is a dark, dry-hopped IPA, described by the brewery as "intensely dark, but with malts that are subtle and smooth." Available at the brewery as well as select liquor, craft beer stores and restaurants throughout BC. A great opportunity to enjoy a local IPA while supporting a worthy cause. Vancouver Island Brewery has a Storm Watcher Winter Lager to help get us through the gloomy winter days (and nights). This is a new seasonal for Vancouver Island, inspired by stormy winters on the west coast. Although a lager may be considered an unlikely choice as a winter warmer, this one is described as amber-red in colour, and being "malty with warming notes of caramel and toffee." Also has a bit higher alcohol content (5.5%), to help keep things warm while still within the range of quaffability. Granville Island has released its fall seasonal, Pumpkin Ale, and has gotten a head start on winter with the release of Lions Winter Ale. Both out and available in B.C. Pumpkin is a limited release for autumn, available in 650ml bottles while supplies last. Lions Winter Ale, a popular winter beverage for several years now, is available in 6-pack bottles and cans, in the Winter Mingler 12-pack, and on tap in select establishments throughout the winter months. Steamworks in Vancouver is celebrating Craft Beer Month with a Brewmaster's Dinner on Oct 24. Four course meal paired perfectly with seasonally appropriate beers in a very tastebud friendly order: Pilsner, Pale Ale, Pumpkin Ale, and Oatmeal Stout. All for $40/person. In June Granville Island became another of BC breweries to jump on the recent trend toward dark, hoppy ales with their limited release 'Cascadian Dark Ale'. May not be your traditional summer beer, but probably goes quite well with the unseasonably cool, wet weather that has been hanging around the west coast. Available while supplies last the Granville Island taproom, BC liquor stores, and select pubs and restaurants in Vancouver. Firehall Brewery in Oliver Open! Firehall Brewery in Oliver, using the slogan "Extinguish Your Thirst" has released it's first batch of beer. Located in the cellar of the old Firehall on Main Street (Hwy 97), operated by Sid Ruhland. The inaugural beer is called 'Stoked Ember Ale' and is available in 50 litre kegs or 1.89 growlers direct from the brewery or on tap in local pubs, including the Firehall Bistro situated directly above the brewery. You can also get a taste at the upcoming Okanagan Fest of Ale on April 13-14. Cheers and best wishes to BC's newest brewery! As usual, B.C. breweries did well in bringing home gold, silver, and bronze medals at the 2011 Canadian Brewing Awards. Of particular note, Fat Tug IPA from Driftwood Brewing was acclaimed as 'Beer of the Year'. The Canadian Brewing Awards is an annual competition where breweries of all sizes across Canada submit their brews for judging in about 40 categories. The judging is done through blind tasting by 25 Certified Beer Judges. Some observers, including myself, consider this event a bit of a big industry hug, where pretty much everybody gets to take home a prize just for showing up. Nevertheless, a medal's a medal and so...congratulations to all the winners! As of earlier this year, Victoria has new brewpub, further consolidating it's position as the good beer capital of Canada. The new outfit is called 'Moon Under Water', started by Don, Boonie, and Ron Bradley, the founders of Bowen Island Brewing back in 1994. The pub is located in the Rock Bay area and is an English-style, self-service pub with conversational atmosphere. Worth checking out, I'd say! Yet another microbrewery is setting up to join the already-vibrant beer scene in Victoria. Hoyne Brewing Co. will be run by Chantal O'Brien and her husband Sean Hoyne. Sean has been a brewmaster in Victoria for the past 20 years, starting with Swans Brewpub for several years, then Canoe Brewpub for the past 13 years. The plan is to get Hoyne Brewing Co. beer on shelves by the end of November, 2011. Best of luck! It's 256 pages and sounds like a very worthwhile read. Published by TouchWood Editions and distributed by Heritage Group Distribution. Yaletown Brewing has what sounds like a very special ale on tap: an Imperial Stout called 'Rocket to Russia', which has been brewed at Yaletown in conjunction with award-winning home brewers Matt Anderson and Danny Seeton. Matt and Danny won last year's Vancouver Home Brewing Awards with this beer and, as part of their award, have brewed a full 14,000 litre batch at Yaletown. Imperial Stout is by definition one of the most robust of beer styles, and 'Rocket to Russia', weighing in at 10.5% alc., sounds like a formidable beverage indeed. Bound to be delicious! Good things keep happening at Penticton's Cannery Brewing: on the heels of recent wins at the Canadian Brewing Awards and the launch of 'No Jail Pale Ale', a lower alcohol beer for those who like to have a tasty beverage and still be able to drive, the brewery is expanding production. So congratulations to Cannery Brewing and we look forward to more great beers coming out of the expanded facilities. Cannery Brewing in Penticton has made an astute adjustment to market conditions, creating a low alcohol beer to cater to those concerned about new drinking and driving rules. Which is just about everybody who enjoys a socialable drink outside the home! The appropriately named 'No Jail Pale Ale' makes sense in the current climate and they have committed to maintaining the flavourfulness that their beers are known for. 3.05% alcohol may seem low by Canadian standards, but is quite typical for a fine session ale in Britain. Could be a big hit this festive season! The infamous Tree Hophead Double IPA released in limited quantities about this time last year is now back on the shelves for 2010, again in 650ml bottles. Get it while you can - it is a huge mouthful of hoppy goodness and they sold out quick last year. At 8% alcohol, you can stretch a bottle over a decent-length conversation. Congratulations to gold medal winners, as well as those recognized for silver and bronze. And a salute to everyone who contributes to make BC a great place for beer! Granville Island has just announced that their popular Lions Winter Ale has been released for the 2009/2010 winter beer-drinking season. This beer was originally launched in 2002 and is Granville Island's "most coveted seasonal brew", according to brewmaster Vern Lambourne, "renowned for its white chocolate taste and vanilla-like finish." I have to admit, not a personal favourite of mine, but I do know lots of other folks who enjoy it, so if you're interested, get it while you can - only available until March. Molson Coors Brewing Co. announced yesterday that it has purchased Granville Island Brewing, through Molson subsidiary Creemore Springs. Creemore Springs was an early entrant into the Ontario craft brewing industry, but was purchased by Molson in 2005. What does it mean for fans of BC microbreweries? Probably not much, certainly in the near-mid term. Granville Island ceased to be an independent brewer years ago and has been operating mostly in Kelowna (a few hundred kilometers from Granville Island) under the umbrella of winery company Andrew Peller. Nor has it been known for particularly distinguished beers, taking a fairly safe, middle-of-the-road approach. Certainly Granville Island makes a finer beer than Molson churns out, and the fact that this deal has been made directly by Creemore Springs would seem to indicate that Molson knows better than to mess up a brewery that has established decent market share in the craft beer segment. So Granville Island won't gain any fans with this move, but they can be expected to gain better distribution. And every Granville tap that replaces a Rickard's tap (Molson's original decoy microbeer) is a small victory for those who prefer to enjoy a pint with at least some legitimate character. 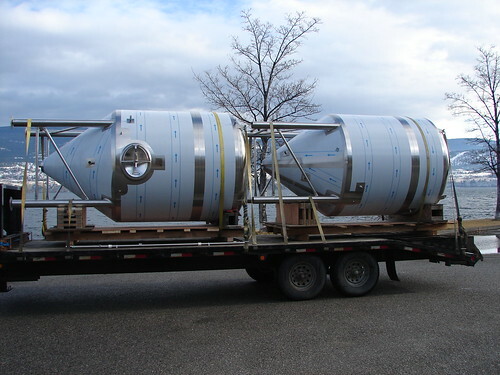 Another upshot is that the main brewing operation will be surely be re-located - since it is currently housed within the Calona Wines facility in Kelowna. Maybe it all gets moved to the 'Capilano Brewery', the Molson brewery in Vancouver? At least it would be within a stone's throw of the original Granville Island location. Current seasonal offering from Granville Island, as of July, is a Raspberry Wheat Ale. Haven't had the chance to try it, and not exactly up my alley, but would probably be a decent pick on a hot summer day for those who like a cool, light, slightly fruit-accented beverage that still counts as beer. I notice that Granville Island has their upcoming schedule of seasonal limited release beers on their website. A definite Belgian slant to recent and future offerings: look for a Belgian Blonde in September, pumpkin ale in October, and a stronger Trappist abbey ale in November. Gotta give 'em credit for keeping things interesting! Russell Berwing has announced a new line of small-batch limited release beers and has kicked off the series with IP'eh. This is reported to be a classic India Pale Aleuch available pretty much only in Vancouver in 650ml bottles and on tap at selected establishments. Russell's Andrew Harris was quoted as saying that the name was chosen to pay homage to Canada's "national affinity with this style of beer" (news to me). He goes on to say that "the name of the beer may be cute but the taste is seriously outstanding!" Sounds like it'd be worth a try, so if you're in the Vancouver area and you spot an IP'eh, better grab it while you can. Tree Brewing is kicking the hop factor up a notch with the release of Hophead Double IPA, taking their popular Hophead IPA to the next level. Limited availability in 650ml bottles. Driftwood Brewing Company opened the doors and rolled out the kegs starting in October, 2008. Already the beers are being poured at an impressive array of pubs in around Victoria. They've even starting bottling in 650ml and sending some of them over to the mainland. It's a given that you don't set up shop making beer in Victoria unless you know what you are doing, and initial reports verify that these guys have some good stuff going on. Two of the first three products reveal strong Belgian sympathies: Farmhand Ale is a Saison and White Bark Ale is a Wit (reportedly quite authentic and tasty). Rounded out the initial line-up is Driftwood Ale, which appears to be a pale ale from the description on the website. Cheers to the newest BC craft brewery! CAMRA Vancouver made the news again with an article called 'On the Quest for the Best Beer' in the Saturday, February 23 edition of the Vancouver Sun. Gives a little background on Campaign for Real Ale and it's origins in the U.K., similarities with the Slow Food movement, and info on the types of events that are held by CAMRA in the Vancouver area. There's also a little bit about beer and food, and even a recipe for Russian Imperial Stout Cheesecake (which would no doubt be even better if you could actually find a Russian Imperial Stout in this province!). Good for the CAMRA folks for garnering some publicity and helping to educate the public on the glories of real ale. After years as a draught-only brewery, Russell Brewing has started packaging several of it's products in cans and shipping them out to private liquor stores in the Lower Mainland and West coast, with presumably other parts of BC to follow. Canned products include: Cream Ale, Pale Ale, Honey Blonde Ale, Extra Special Lager. The Russell website has a list of retail locations. CAMRA Vancouver, the local chapter of the international consumer organization in support of real beer, has selected Central City Imperial IPA brewed by the Central City brewpub in Surrey, as their gold medal beer, according to this Jan. 31 article in the Vancouver Sun . The members of CAMRA obviously have an affection for robust ales, judging from the fact that their silver medal went to Storm Brewing's Black Plague Stout and bronze went to the might Back Hand of God Stout brewed by Crannog Ales. I like their style! Awards also went to Phillips Brewing for Best Brewery and SteamWorks for Best Local Brewpub, with silver and bronze medals also awarded in these categories. Other awards were also handed out in categories such as best seasonal beer, best local pub, and best local beer event. As of today, CAMRA has not yet posted the list of winners on it's website, but they do have the list of 2007 winners. BC craft brewers have medaled in a bunch of categories at the 2007 Canadian Brewing Awards, an event where breweries from across Canada submit their products for evaluation by an independent panel of certified beer judges in a blind tasting event. The 3 highest rated beers in each style category are awarded gold, silver, and bronze medals. Of the 21 categories covering the spectrum of beer styles, BC brewers received medals in 14 of the categories, for a total of 21 medals including 6 gold, 9 silver, and 6 bronze. In all, 10 BC breweries earned medals. Congratulations to all the winning breweries! The biggest BC winner was Phillips Brewing, who walked away with 4 medals (Fruit/Vegetable Beer: Raspberry Wheat; IPA: Amnesiac Double IPA; North American Amber/Red Ale: Blue Buck; Strong/Belgian Ale: Surly Blonde). Three medals were won each by Tree Brewing (Hophead IPA, Kelowna Pilsner, Cutthroat Pale Ale) and Swans Buckerfields Brewery (Swans Legacy Ale, Swans Scotch Ale, Swans Oatmeal Stout). Other winners were: Canoe Brewpub, Lighthouse Brewing, Mt. Begbie Brewing, R&B Brewing, Russell Brewing, Vancouver Island Brewing, Whistler Brewing. Visit the Canadian Brewing Awards site for the complete list of Award Winners. The site also has information on the style guidelines used to judge each style category. There is a short but informative article on B.C. Christmas/Winter beers in today's (Nov. 20) edition of the Vancouver Sun. Written by Michael Kane, it gives a good overview of some of the treats to look forward to over the holiday season, such as Phillips Brewing's "Instigator" dopplebock (8.5%), a doppelbock from Granville Island (8.7%), and the always-popular (and certified organic) Faceplant Winter Ale from Nelson Brewing. Check out the article if you get a chance, and in any case check here at the B.C. Beer Guide for updates on seasonal offerings and events. The festive season is upon us! Westworld travel and active living magazine from BC Automobile Association features an article on the Victoria beer scene. Writer Jeff Bateman visited Swans, Spinnakers, Canoe Club, and Hugo's brewpubs to get a flavour for the current state of the art along with a sense of brewing history in the region and reference to Vancouver microbreweries as well. Westworld is distributed to BCAA members. Russell Breweries of Surrey, BC has entered into an agreement to purchase the shares of Fort Garry Brewing Co., Manitoba's largest brewer, in order to merge the companies. Both companies are listed on the TSX Venture Exchange. More info in news releases on the Russell website. You can now rate your favourite brewery or beer on the BC Beer Guide - a new feature that has recently been added to the site. To rate a brewery, go to the brewery listing by selecting the brewery from the dropdown list on the HOME page or from the list on the BREWERIES page, click on 'Add Your Comments on this Brewery' and select a rating from 1 (poor) to 5 (excellent). To rate a beer, find it on it's brewery listing page or select it from the list on the Beers page, click 'Add Comments on this Beer' and pick a rating from 1 (bad) to 5 (excellent). Once we accumulate some ratings we will start to list the higher ranking breweries/beers on the home page. So dig in and help spread the word about beers you love...or don't care for so much! Down with Beer Taxes...At Least for a Day! Lincoln McCardle thinks Canadians should get a break from onerous beer taxes, at least 1 day a year. He has started an online-petition demanding the federal government provide an amnesty from beer taxes on the Friday at the start of the Canada Day long weekend each year. As of July 10, 2007, he has 20 signatures and counting. You can add your voice to the cause by visiting the Canadian Tax-Free Beer Day petition. Throughout the month of April, Granville Island Brewing donated $0.25 from every case and $.05 from every pint sold to the Stanley Park Restoration Fund. They surpassed their goal and raised $55,000, which was recently passed on to the Fund. Nice contribution to a great cause! Throughout the month of April, Granville Island Brewing will donate $0.25 from every case and $0.05 from every pint to the Stanley Park Restoration Fund with the goal of raising $50,000 based on last years sales. As someone who has recently visited Stanley Park and seen the destruction caused by storms this winter, I salute Granville Island for this initiative and encourage anyone with any affinity for that great park to buy a pint or box of Granville Island during April. Barley Station Brewpub Opens in Salmon Arm! The Barley Station Brewpub opened in Salmon Arm in January, becoming the first brewpub in the North Okanagan. Already it's creating quite a stir, with an unprecedented number of visitor comments - negative and positive - on the B.C. Beer Guide. If you have been to the Barley Station, feel free to weigh into the discussion here. Also, as I don't have any information on the beer selection that the Barley Station is offering up, I encourage anyone to either email me directly (address at the top of the page) or add their opinions of the beers in the comment section. Meantime, I'm going to try to make my way to Salmon Arm myself to see what the rumpus is all about! Pacific Brew News Radio, an integral part of the PacificBrewNews.com website, has released recordings of a recent beer tasting session here in British Columbia. Rick was in town from California, so we caught up with him and shared some BC beers and brewery stories with him. You can download the podcast in 2 parts to hear our rambling tour of the BC beer scene. Best enjoyed with several fine ales. The Nelson Brewing Co. recently became a certified organic brewery, updating their slogan from 'Legendary Ales' to 'Legendary Organic Ales'. Although organic sources of some types of malted barley and some varieties of hops are in relatively short supply, the brewers appear to have done a decent job of maintaining the character of their beers. And now folks can feel even better about drinking craft beer from Nelson. Phillips Brewing has put up a website with lots of good info on the brewery. We get a lot of requests about the fine beers of Phillips here at the B.C. Beer Guide, so the new site will be a good resource for beer lovers. In addition to brand descriptions and brewery background, there is (or will soon be) a list of places you can find Phillips products. Also a form where you can submit your own beer ideas! Phillips Brewing of Victoria is now offering it's majestic India Pale Ale, formerly available only in the big 650ml bottles, in regular 6-packs. To my knowledge, this is the first Phillips brand sold in 6-packs - a trend that will hopefully continue. Sapporo Breweries of Japan looks set to buy Sleeman Breweries of Guelph, Ontario, based on an offer that was enthusiastically accepted by Sleeman's Board of Directors earlier this month. The major implication of this from a BC beer fan's point of view is that Sleeman owns Okanagan Spring. Hopefully, Sapporo will continue to operate the Vernon brewery, and continue the traditions established by Okanagan Spring and for the most part carried on by Sleeman. Tree Brewing celebrated 10 years in the business with with friends and customers on July 8 at the brewery. As added bonus, everyone of legal age received a 650ml bottle of beer! Lots of changes over the last 10 years, but the brewery seems to be going as strong as ever. Here's wishing continued success for at least another 10! Two B.C. breweries have received recognition at this year's World Beer Cup. Okanagan Spring Brewery of Vernon won a gold medal for Shafetbury Coastal Cream Ale and R&B Brewing of Vancouver won bronze for Raven Ale. The boys at Pacific Brew News (link below) have done the rounds of BC India Pale Ales and have declared Tree Hophead their favourite. Their thorough analysis will be presented on their website in the near future. Meantime in the podcast section of their site, you can check out two recent podcasts on BC beers. Kamloops Brewing, marketing their beers under the brand 'KB' has been formed as a result of ownership change at Bear Brewing. (See earlier item.) New KB beers are expected to be in liquor stores before the end of March. Their new website provides information on the outfit. 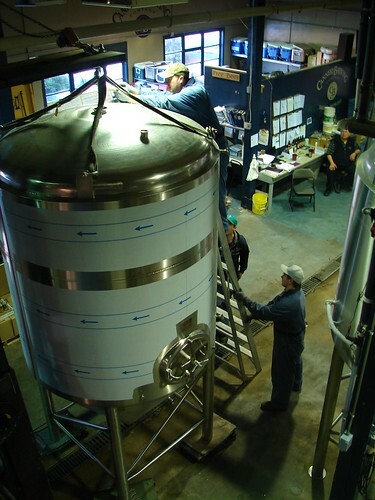 In late 2005 Bear Brewing was purchased from Calgary's Big Rock Brewing by Bruce Dean and partners. The name has been changed to 'Kamloops Brewing.' According to an article in the Kamloops Daily News (link below), the new owner has big plans for growing the brewery with new brands and new marketing. Thanks to Josh from Airdrie for the tip. Vancouver's renowned Gastown brewpub now has a sister operation in West Vancouver: SteamWork's Village Pub and Restaurant. Located at the Village at Park Royal and identified by a large red/white lighthouse, it looks like a stylish place of good ales and fine dining. Re-launch of the BCBG Website!! Welcome to the all-new BCBG website - designed to make it much easier to get information of interest and to enable visitors to leave their own comments on the beers of British Columbia. Hope you like the new site and will take a few minutes to add some comments on your favourite brewery. BC Beer Awards & Festival - an excellent combination - celebrates the very best craft beer brewed in British Columbia. Hopscotch, Vancouver's whisky, beer, and spirit festival returns with a week of events from Nov 11-17, 2013. Associated events include meal pairings and special tastings around town, master classes on products (mostly whisky brands, and mostly sold out), and the main event: Grand Tasting Hall at PNE Forum on Nov 15-16, featuring over 300 beverage products for the tasting. Full Hopscotch details and ticket info. Yaletown Brewing is once again hosting their 'Gumboot Salute', a celebration of brewmasters, fresh beer culture, and fresh beer drinkers. Festivities run Nov 7-10th, with a Cask Festival features casks from a bunch of local craft brewers on Sunday, Nov 10th. More info on their Facebook page. Details to follow in the next few days, but promises to be an awesome week of beer events in Vancouver. Best place to get info and find out about tickets is to check the facebook page linked below. Harrison Hot Springs is celebrating Craft Beer Month in BC with the Harrison Beer Festival, bringing beer from around BC to the shores of Harrison Lake. Never a better excuse to enjoy the Harrison Hot Springs area. The 3rd Annual British Columbia Beer Awards are being held on Oct 13, 2012 in Vancouver at Chapel Arts. Open to the public, the event is being held in conjunction with the CAMRA's Harvest Cask Festival consumer tasting. The primary goal of the BC Beer Awards is to reward excellent beers even if not brewed exactly to strict style guidelines. Secondary is ensuring that every beer brewed in BC can be entered regardless of whether it fits in a style or not. A preliminary list of categories will be issued shortly, with reference to the various BJCP (Beer Judge Certification Program) categories they include. Last year?s award ceremony included over 400 unique entries from over 35 BC breweries and brewpubs, with winners selected in 12 distinct categories. Judges included certified Beer Judges, Cicerones, Sommeliers, Journalists, as well as noted beer and food lovers. Tickets for the 2012 BC Beer Awards, including the awards ceremony and Cask Festival are set to go on sale on September 1st. Please visit www.BCBeerAwards.com for the latest updates. Vancouver Craft Beer Week festival will be May 18 - 26, 2012. VCBW is a nine-day celebration of craft brewing, consisting of signature events, independently organized satellite events, and weekly craft beer specials hosted in venues across the Lower Mainland that attract a diverse demographic of local and international visitors. Last year?s VCBW saw more than 5,000 people purchase tickets to over 50 events, including six days of special tastings, brewmaster dinners, and seminars, closing with a two-day beer tasting festival with 1,350 people in attendance. Event details and ticket sales will be announced via VancouverCraftBeerWeek.com and the usual social media outlets. It's back...17th annual Okanagan Fest-of-Ale, where many of the finest craft brewers in B.C. and beyond gather to showcase their wares to the public at the Penticton Convention Center on Friday, April 14 (4-9pm) and Saturday, April 15 (noon-6pm). If you've been before, you'll probably be going this year, and if you haven't been before you are are in for a treat. Great opportunity to sample some of the less widely-distributed beers from smaller breweries such as Crannog Ales, Mt. Begbie Brewing, or Old Yale Brewing as well as out-of-province outfits like Alpine Brewing and Port Townsend (both of WA) and Paddock Wood Brewing (SK). Tickets available in advance only, and can be purchased online. "Voted by USA Today and Orbitz.com as one of the top places to toast Oktoberfest, this three-day festival features a Tasting Garden, two stages with live music, Sunday Dogtoberfest activities and an Oktoberfest Village with Kids Area and 5K run." Sounds most excellent! Advance tickets available August 17. CAMRA Vancouver is putting on a hopped-up Fest of Ale that is bound to satisfy IPA-lovers. Local brewers will have their finest IPAs on hand at St. Augustine's Craft Brew House on Commercial Drive, from 12-5pm on Saturday, Jul 23. Tickets go on sale Jul 5 and can be purchased online. Get 'em while you can, they are expected to sell out. Vancouver Craft Beer Week, May 6-14 - Tickets On Sale! Tickets are now on sale for Vancouver Beer Week, being held from May 6-14, 2011. A craft-beer lover's dream come true, Vancouver Beer Week will consist of a series of signature festival events and independently-organized satellite events at numerous venues around town. 55+ breweries, 70+ venues, 9 days of beer...one guaranteed excellent week! Spring is approaching and that means the Okanagan Fest-of-Ale in Penticton to kick-off the beer-drinking season! This year it will go from 4-9pm on Friday, April 8 and 12-6pm on Saturday, April 10. Tickets available March 1 and, as with recent years, are available ONLY in advance - no tickets at the door. Always a good time, so grab your tickets and get ready to rock 'n' roll. Langley Rotary hosts the TIP N TASTE beer sampling event on Saturday, June 12 at the Coast Casino and Convention Center in Langley. A real mix of beers available, as well as a variety of food vendors. 15th Annual Okanagan Fest-of-Ale kicks off Friday, April 9 and continues Saturday, April 10. One of the premier beer events in Western Canada, always a fine array of beers on hand, lots of good food, live music, happy crowds, good times for all. As with last year, tickets are ONLY available in advance. Hamilton Street Grill in Yaletown, Vancouver is serving up some slow-roasted prime rib accompanied by R&B Brewing's Bohemian Lager in a 'communal table' setting. $18 for beef and beer! Granville Island Brewing hosts 'UK Night' at the Granville Island Taproom to kick-off the International Beer Exchange between Granville Island and Fuller's brewery of London. Fuller's London Pride on tap, along with beer trivia, food. 6pm-8pm. What do you get when you cram a large tasting hall with some of the world's finest beer, Scotch, whiskey, and related spirits? Hopscotch! Held this year at the Rocky Mountaineer Station downtown Vancouver from Nov 16-20. Tickets on sale Oct. 1. Three Rotary Clubs in Langley are putting on a beer tasting event Saturday, June 13 at the Coast Hotel in Langley, BC. Don't have much more information but the website for the 2008 version of the event is shown below. The Kelowna Beer Festival is rolling on for the second year in a row, hosting beer enthusiasts on Friday, May 22 (4-9pm) and Saturday, May 23 (12-7pm). Tickets are available online . Should be worth checking out. For more info: www.kelownabeerfest.com - a flashy and somewhat useful site (especially if you turn the cheesy music off). Last year was a relatively small affair and although not exactly a raging success, hopefully things will be build from there to a bigger and better festival this year. The event will be held in the Kelowna Curling Rink again, which proved to be a less than ideal venue last year due to the nasty acoustics and lack of air circulation. Particularly unfortunate to be cooped up in a big concrete box on a weekend when you know the weather in Kelowna is going to be fabulous - would be awesome to have this as an outdoor event! Once again it is that time of year: the snow is melting, the temperature's rising, and the beer starts flowing at the Okanagan Fest of Ale. Now in it's 14th year, this festival is well-established as one of Canada's finest such events and an excellent opportunity to mix it up with some of the great microbrews of BC and neighbouring provinces/states. Due to the popularity of the Fest in years past, culminating in a rather zoo-like atmosphere last year (at least on Friday night), organizers have pulled in the reigns a bit. Tickets will not be available at the door and will be sold in more limited numbers than in the past. Will be great to have a little elbow room! Those busy guys at Just Here for the Beer are once again putting on their big show, the Canada Cup of Beer at UBC Thunderbird Stadium on July 5, 2008. Brewers and importers from across the country have been invited to serve up their offerings and compete for prizes in categories ranging from beer styles to packaging, as selected by the folks attending. 36 beer vendors, 150 beers = 1 good time for everybody. First annual Kelowna Beer Festival will be held May 30-31, 2008 at the Kelowna Curling Club. It will run 4-9 on Friday and 12-9 on Saturday. Just Here For The Beer presents the 2008 Wine and Beer Festival. This year's event will be held at the Plaza 500 Hotel in Vancouver. The only Wine and Beer Festival in Town and not a bad deal at $40/ticket, which includes all samples, appetizers and live entertainment. Get a taste over 100 beers and 100 wines being showcased in this year's event! The Okanagan Fest-of-Ale is a lively and well-attended event - both in terms of breweries and beer-lovers - held each spring in Penticton to kick off the beer-drinking season. This year's edition is being held Friday, April 4 (4-9pm) and Saturday, April 5 (12-7pm) at the Penticton Trade and Convention Center. Put off the spring cleaning for another week and get a taste of the best of BC beers! The Campaign for Real Ale Vancouver and The Alibi Room present an unforgettable beer and chocolate tasting with handmade chocolates from Yaletown's Chocoatl. Chocolatier extraordinaire, Themis Velgis, will provide a selection of custom chocolates specifically created to pair with a range of draft BC craft beers for a diverse flavour experience. Discover beer as you've never had it before! The boys at Just Here for the Beer are once again presenting "Beer My Valentine's" at the Granville Island Brewing Taproom. Starts at 7pm on Thursday, February 14th, so grab your sweetheart and join in. No Vancouver Autumn Brewmasters Festival? September should see the 10th annual Vancouver Brewmasters Festival, but there has been no sign of the event taking place. The festival website - www.autumnbrewfest.com - has been dismantled. The 2007 Canada Cup of Beer will be held on July 7th, 2007 at UBC Thunderbird Stadium. According to organizers, last year's festival boasted the largest selection of breweries ever assembled in Vancouver for a beer festival. This year, Canada Cup will also feature unique events the week of the festival. Tickets for the festival and the satellite events are available online and at select ticket outlets. Check the website http://www.canadacupofbeer.com/ for more details or sign up for the event newsletter and be first to get festival updates and information. Capones Restaurant and Live Jazz Club in Vancouver will be hosting a beer pairing dinner on June 19th, 2007. The first of their 'Savour Summer' dinner series, the theme for the evening will be 'Rediscovering the Essence of Beer' and will feature a 6 course dinner paired with 6 signature beers from Quebec's Unibroue Brewery. (Okay, not a BC brewery, but a fine outfit and a good choice for this type of event.) Check out the menu (.pdf)! The event starts at 7pm at Capones Restaurant - The "Vault", 1141 Hamilton Street in Yaletown, Vancouver. For more details, see the link below or call 604-684-7900. Okanagan Fest-of-Ale is being held April 13-14 this year. Always a great way to kick off the spring/summer beer-drinking season! JustHereForTheBeer.com presents the 2007 Wine and Beer Festival at UBC on Friday March 30th, 2007 from 4-8 pm in the Student Union Building. This is the third annual event and this years festival will have 28 venders pouring microbrews, domestic products, specialty import beer and, BC and international wines. Several products will make this festival their debut event in British Columbia. There will be several flavoured beers and draft only products not currently available in bottles or cans. The event ticket also includes two beer and food pairing seminars. 9th Annual Vancouver Autumn Brewmasters Festival kicks off at 5pm and goes until 10pm at the Edgewater Stage, Plaza of Nations. 30 microbreweries, over 100 beers to taste. Sounds good! The marquee event for Canadian beer lovers, featuring the best of B.C. and beyond. Mountain of Ale Beer Festival is being held on Saturday, August 26 up at the Silver Star ski resort just outside Vernon, BC. Breweries from around BC and Alberta will be on hand to showcase their specialities in the scenic resort, which also boasts some fine mountain biking in teh summer months. Nothing like a hard-driving mountain bike ride followed by a tasty BC craft brew. The first ever Canada Cup of Beer will be held at UBC Thunderbird Stadium in Vancouver on July 8, 2006. This is a combination competition/exhibition organized by Just Here for the Beer, a beer education organization. Sounds like it will be a great event. The Okanagan Fest-of-Ale in Penticton is always a great way to kick-off the summer beer-drinking season. Dave Holden is hosting what is sure to be an excellent adventure indeed: his annual bus trip from Vancouver to the legendary Oregon Brew Fest! Climb aboard and let the good times roll from July 29-31, 2005. The Whip Restaurant Gallery is hosting their award winning 5th annual Feast of Five Firkins! The deal: come hungry, come thirsty ? leave satiated! This event, inspired from craft beer and food enthusiasts, was once foreign to the general public in the lower mainland. Now, thanks to CAMRA (Campaign for Real Ale), local microbreweries and restaurateurs alike; the craft beer movement has taken on a life of its own!! The Whip Restaurant has been a long time proud supporter of Craft Beer and quality food. They are a fast paced restaurant, and cannot support a 5 star menu on a regular basis; this event showcases what they can do... and gives them something to brag about.